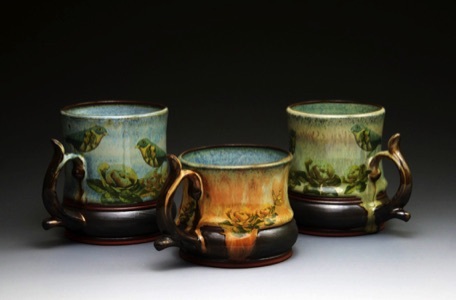 Kate Westfall is a functional potter, living in Stafford, VA, creating thrown and altered stoneware pieces. She attended Alfred University in New York where she received her BFA in Ceramics. After graduation, she moved to the DC area where she currently teaches at the Workhouse Arts Center and shows her work at the Torpedo Factory where she is a member of Studio 22. Kate strives to create work that is tactilely enticing and comfortably elegant. By incorporating historical patterns from different cultures and hand drawn images, she seeks to emphasize the universality of the human experience through her work. Click here for her website. Follow her on Facebook.